Born in Arona (Novara), Italy, in 1946, Alberto Alessi is president of Alessi S.p.A. and head of Marketing Strategy, Communications, and Design Management. The eldest son of Carlo Alessi, Alberto belongs to the third generation of the Alessi family, and officially joined the company in 1970, the day after he received his law degree. He initially was in charge of commerce, the development of new products, and communications. Since 1970, he has collaborated with architects and designers around the world to enhance the company’s reputation of working with key names in the field of international design. 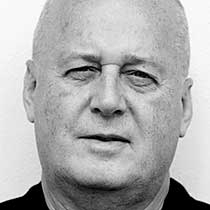 Alberto Alessi has written several books, including La Cintura di Orione (1986), Not in Production, Next to Production (1988), and The Dream Factory: Alessi since 1921 (1998). During his career he has contributed articles to many international magazines and publications and he has been a visiting professor at several design colleges. A member of the Academic Board of the University of Industrial Arts in Helsinki (UIAH), Alessi also sits on the Honorary Committee of the Design Museum, London. He became Senior Fellow of the Royal College of Art, London, in 1993; Doctor Honoris Causa of the UIAH, 1993; Honorary Professor of the Hochschule der Bildenden Künste, Saarbrucken, 1994; and Doctor of Fine Arts at Miami University of Oxford, Ohio, 1995. In 1998 he received the Design Award for Lifetime Achievement from the Brooklyn Museum of Art. He received an Honorary Degree of Doctor of the University from the University of Central England, Birmingham, in 2001; was named a Master at the Atelier de Formation en Haute Pâtisserie de l’Ecole supérieure de cuisine française (ESCF Ferrandi) in Paris, in 2008; was granted an Honorary Doctorate of Arts from Lincoln University (UK) in 2010; and was the recipient of Collab’s Design Excellence Award for 2010 at the Philadelphia Museum of Arts. Alberto Alessi curated the exhibition “The Dream Factories: People, Ideas, and Paradoxes of Italian Design Factories” at the Triennale Design Museum in Milan. Opened on April 6, 2011, and on view through February 26, 2012, the exhibition illustrates Alessi’s vision and analysis of what he refers to as the “factories of Italian design.” According to Alessi, these factories have developed a series of highly specific artistic intermediation practices, which are among the best expressions of international contemporary product design on the one hand, and of the market, on the other.